As someone who started taking Spanish classes in 2nd grade, I have a strong fascination with hispanic culture. Combine this with my love for Halloween, and what do you get? El Día de los Muertos! It’s actually rather arrogant to call it Mexican Halloween: though it takes place around the same time as Halloween (Nov. 2) and has to do with the dead, it has very different connotations. Day of the Dead honors friends and family who have passed while celebrating life; it does not try to augment our fear of death, but rather shows us that death is merely another part of life. This is why so many of the decorations for Day of the Dead show skeletons engaging in fun, lively activities like playing musical instruments and getting married. Day of the Dead is a very colorful and artistic holiday, so yesterday I went to the National Museum of Mexican Art in Chicago to see their 25th annual Día de los Muertos exhibit. Skeletons and skulls abounded, as did bright, festive colors, floral imagery, and Trees of Life, which combine the ideas of life and death by having skeletons hanging out in the branches. 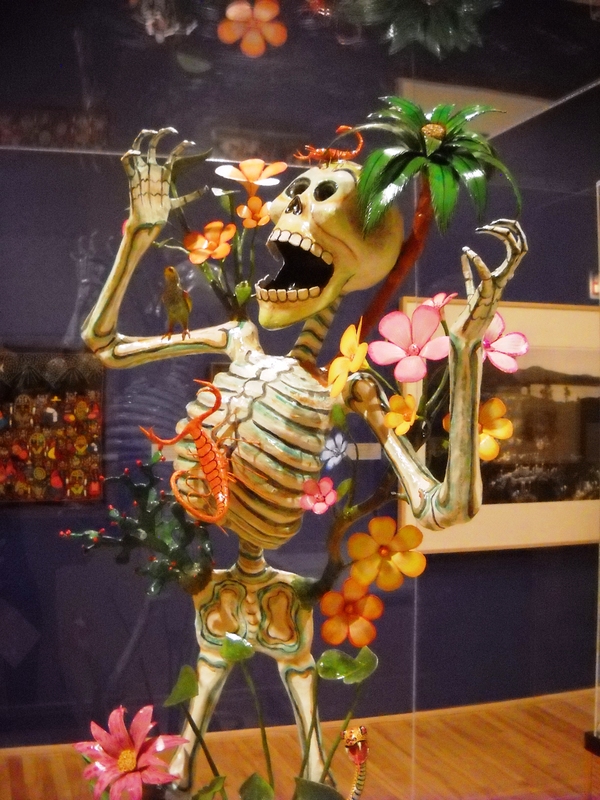 The sculpture on the left also depicts the holiday’s connection between life and death with the skeleton entangled in flowers, plantlife, and creatures. Day of the Dead is celebrated by putting up decorations such as these, erecting altars in remembrance of the deceased, and having picnics in the cemetery. Just as Halloween is traditionally the time of year when the dead can return, so too is Day of the Dead a time when those who have passed might come back to party with the living. That’s why the altars usually include the deceased’s favorite food, because being dead probably makes you hella hungry. The traditional flower of Day of the Dead may seem counterintuitive: the Mexican marigold. This flor de muertos is bright yellow (as you can see in the altar above), which isn’t the color you might initially associate with death. These flowers and the food are the ofrendas, or offerings, to the dead, usually lit up by candles and surrounded by personal mementos that represent the deceased. 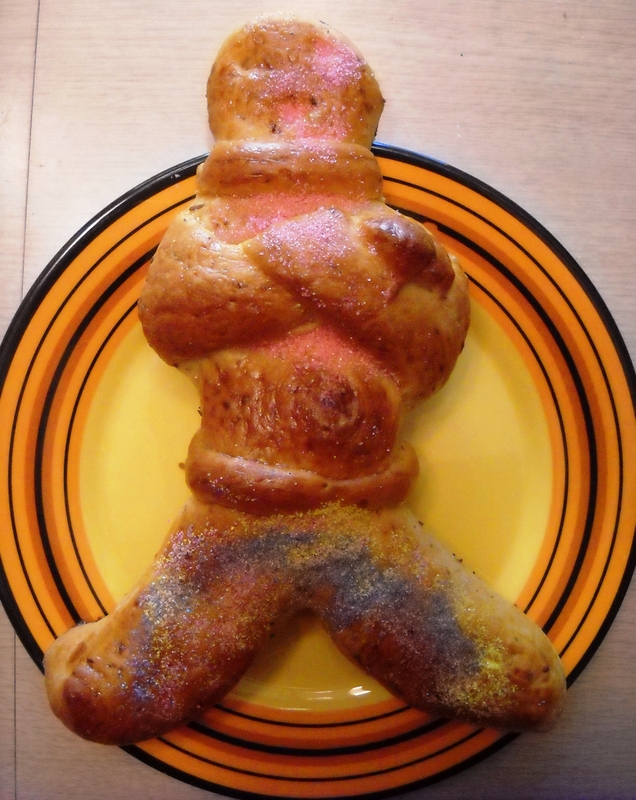 One specific type of food that is offered to the dead or eaten by the living is the pan de muertos, or bread of the dead. After my journey to the museum, my mom and I found a bakery and bought some: it’s a soft sweet bread that is usually covered by an orangey glaze and is shaped either as bones or a bun. This one was kind of hard and not sweet aside from the sprinkles, which was disappointing, but at least it was in a fun shape. Day of the Dead is certainly partial to sweet things, from the bread of the dead to what is probably the most iconic image of the holiday: sugar skulls! 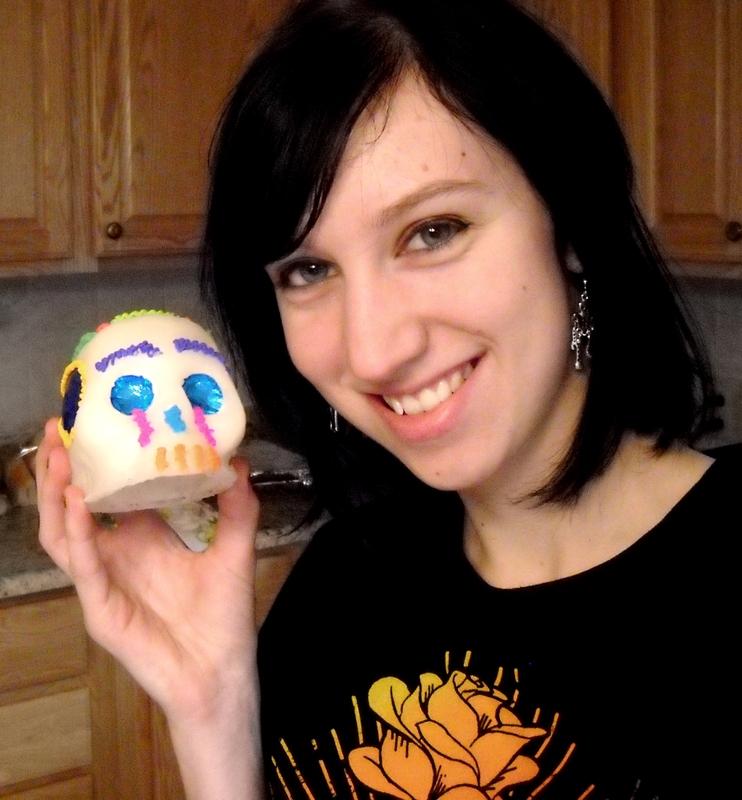 Traditionally, these calaveras de azúcar are made of sugar and meringue, molded into skulls, and decorated with colorful icing, sequins, tinfoil, etc. They’re edible, but I’m not sure who would want to eat a hunk of pure sugar. At the museum’s gift shop, my mom and I bought one for our house. The calaveras also appear in non-edible form in artwork celebrating the Day of the Dead. 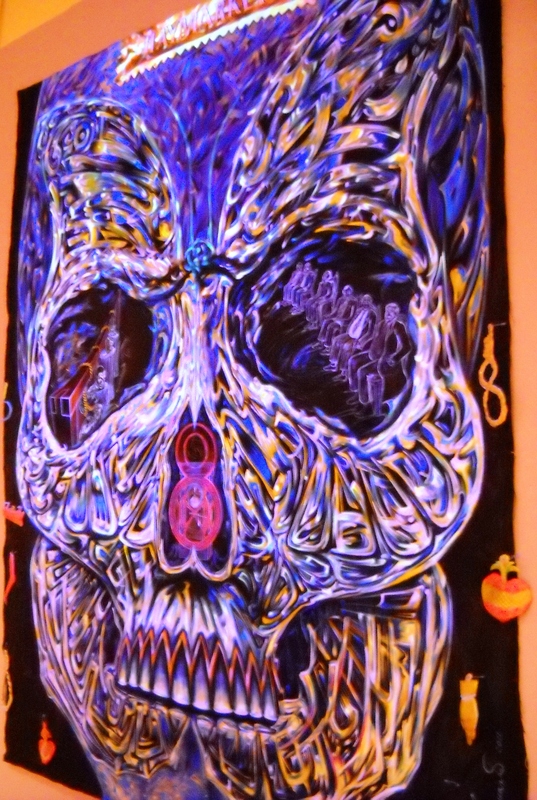 There was a very cool calavera painting at the museum which was huge and glowed ethereally under a black light (picture below). The beauty of the sugar skull has become such a phenomenon that you can find calaveras on anything from clothing to jewelry to tattoos (often on people who aren’t even Mexican). Even non-hispanics such as myself can enjoy el Día de los Muertos. While it has deep ties to Mexican culture, the holiday explores the universal themes of life and death and ends up being a big celebration of the former. 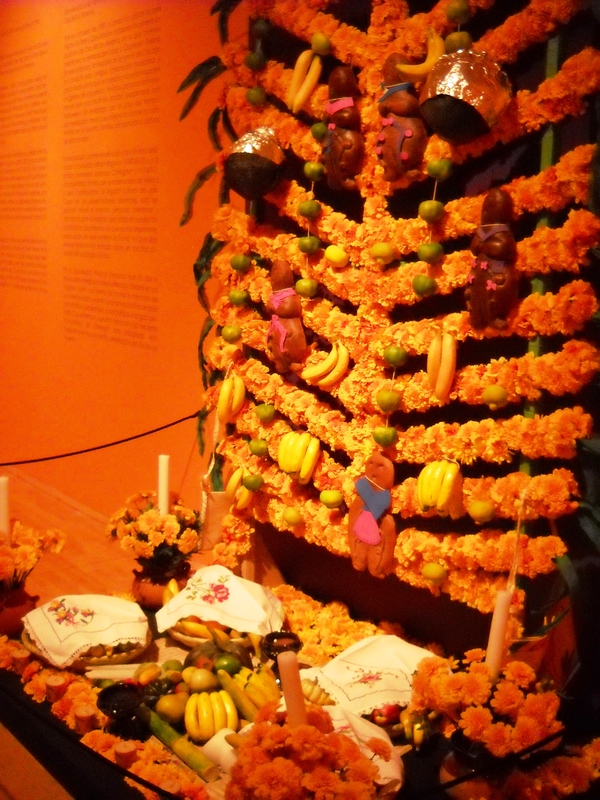 I’m really glad I got the chance to go to the National Museum of Mexican Art and get a little taste of how other cultures celebrate the coming of All Souls’ Day on November 2nd. I find it so refreshing that the arc of life and death be celebrated and honored with Día de los Muertos . Thanks for sharing your cool day and thoughts experienced at the National Museum of Mexican Art. Picnic in a cemetery…. sounds serene. It’s definitely a unique holiday that seems foreign to Americans because of the way their culture views death. I wouldn’t mind a picnic in a cemetery, but then I am a little strange, haha. It’s nice to hear from you; I hope things are going well in MA!